In Flack this week: Panto time at Weber (oh yes it is! ), Halpern hosts the stars, Laps land, Meghan Markle and dozy marketers. 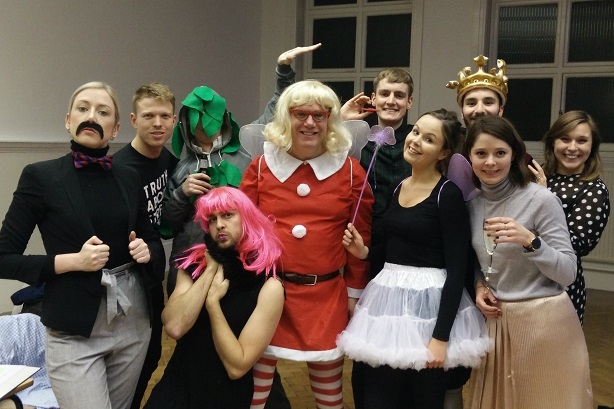 Christmas season well and truly arrived in Waterhouse Square this week with Weber Shandwick's corporate, financial and public affairs team putting on a pantomime for the amusement of the rest of the agency. Flack isn't quite sure what the story was (not the first time PRWeek's cynical staffers have said as much of a PR firm's efforts), but the fairy godmother character was portrayed by director Patrick Harrison (above, centre) - a man used to dealing with dames and other nobility, having joined the agency in 2014 after 14 years working for the Royal Family's comms teams. Other roles were taken by former David Cameron aide Kate Shouesmith, as orphan Annie, while financial director Nick Oborne played an ogre, but is not pictured above - Flack understoods he was a touch disappointed at only getting three lines in the production. The team's leader Ben Burton, who is about to performance a Bur-xit, did not have a role. Elsewhere, last night was the Christmas party for MSLGroup and sister firms in Publicis' 82 Baker Street office. Kudos to corporate director Blair Metcalfe, who Flack hears was due at the PRCA Council meeting earlier in the evening armed with the requisite fancy dress for the '70s theme. 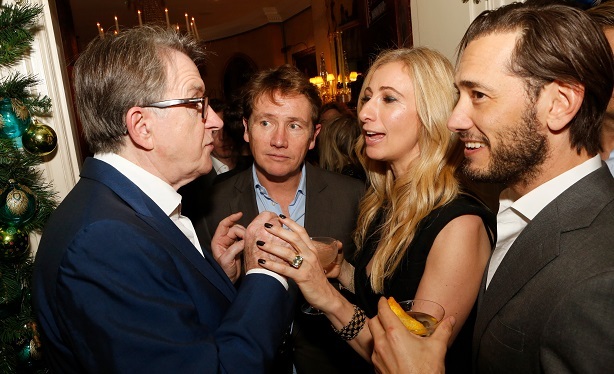 There was star-spotting aplenty to be done earlier this week at a party at Mark's Club hosted by PR entrepreneur Jenny Halpern Prince and Johnny Hornby, whose WPP-backed The&Partnership includes her agency Halpern. Halpern (and Hornby, with blue shirt) is seen below meeting Lord Mandelson, something of a PR man himself as chair of fellow WPP shop Global Counsel. Halpern's husband Ryan Prince is on the right. 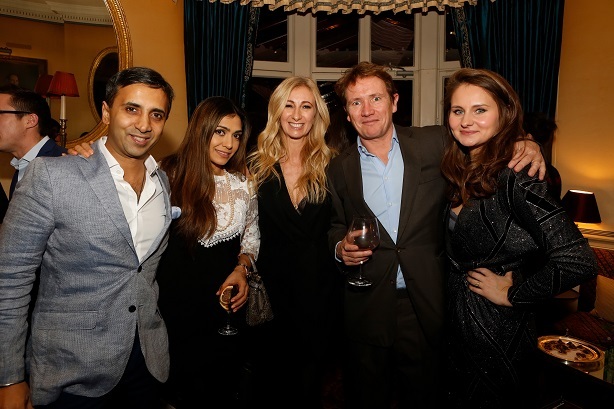 Other guests included Trinny Woodall, who Flack presumes knew what to wear, ITV's Robert Peston and Dragon's Den star Tej Lalvani, pictured below with his wife Tara, the hosts themselves, and Halpern director Alex Pinder (right). Not present was Halpern's friend Sadiq Khan, whose charity she has just joined as a trustee - the Mayor is currently in Pakistan. For anyone who doubts the existence of Father Christmas (unlike Flack) there were 2,000 Santas in attendance at Clapham Common last weekend. They had congregated in SW4 to run the London Santa Dash 2017, raising funds for Great Ormond Street Hospital this Christmas. Among the runners was PRWeek editor-in-chief Danny Rogers, who completed the 10k route in 54mins, and personally raised £430 thanks to donations from friends, family and generous colleagues in the PR industry. 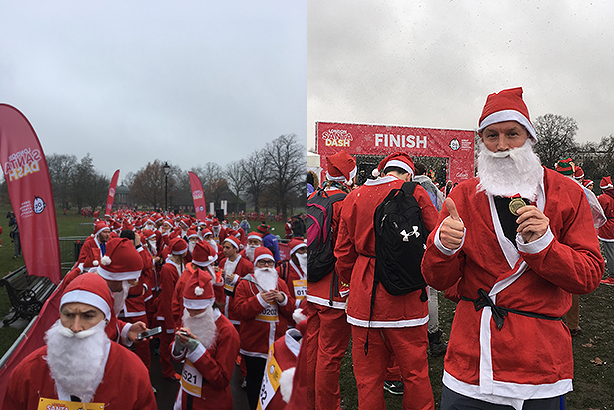 Combined, the 2,000 people braving the muddy circuits (there is also a 5k route) in full Santa suits raised more than £160,000 for the famous children’s hospital, where every day – even at Christmas – 618 seriously ill children from around the country arrive for treatment. On the subject of dashing, PRWeek – with dashing news editor Sam Burne James at the helm – is launching its own running club, with the first trot scheduled for the new year. See last week's Flack for more details. You may have heard there’s going to be a royal wedding next year. Late last month Clarence House announced that Prince Harry had proposed to his girlfriend Meghan Markle. But who knew the wife-to-be actually worked for consumer shop Tin Man Communications? Well, nobody, because that isn’t exactly true. However, Tin Man senior account executive Danni Burnett is a dead ringer for Markle, and the agency wasted no time in spoofing the proposal on Instagram (below). Tin Man had a surprise visit this morning from the newly engaged Prince Harry and @meghanmarkle! ?? Such is the likeness, celebrity lookalike photographer Alison Jackson wants to do a shoot with Burnett, Tin Man founder Mandy Sharp told Flack. Jackson’s previous work has included shots of The Queen changing a nappy and Donald Trump elongating his fingers, as well as of Prince William and the Duchess of Cambridge having a cheeky brew indoors. Sharp also joked that Burnett had been put her forward for Reveal magazine’s request for Markle lookalikes. Flack wishes her the best of luck. Marketing professionals are among the sleepiest people in Britain, according to a study by Jaywing PR for bed retailer Time 4 Sleep. A poll of 1,000 Brits found 67 per cent of marketing professionals admitted to sleeping in every morning – the third-most-likely profession to do so. Doctors, nurses and dentists were found to be the most likely to sleep in (86 per cent), while artists and designers were second (75 per cent). The research also shows women are twice as likely as men to hit the snooze button in the morning (22 per cent versus 11 per cent), while those aged 25 to 34 years old were found to snooze their alarms for an average of 33 minutes every morning. Elsewhere in the research, 27 per cent of couples in the capital admitted to invading their partner’s personal space when sharing a bed. Unsurprisingly, the bed retailer says sleep can be improved with a comfortable mattress or pillow. Who knew?